We are so happy to have Rachel as our Farm Assistant. Rachel is a Berkeley native who grew up alongside her family’s artisan baking business. The art of baking, marketing and bringing the foods her family produced to the public were central to her upbringing. When it was time to go to college, she decided to study sustainable agriculture in order to explore the production side of bringing food to the table. 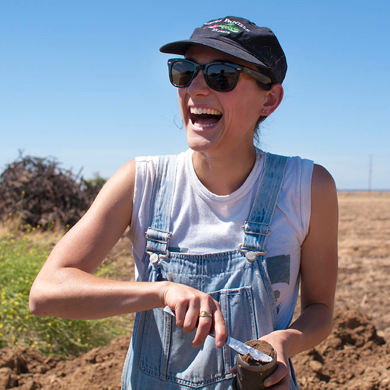 While pursuing her degree at Cornell University in the College of Agriculture, she discovered a passion for soil science. She was excited to put her passion to purpose following her graduation with an internship at TomKat Ranch (see this week’s note and the note from last week for more information on TomKat)where she developed a program to enhance the soil monitoring system they had in place. At Tom Kat, she expanded analysis of their soil outside of the basic chemical analysis of nitrogen, phosphorus and potassium, which is an industry standard, to encompass biological analysis, micronutrient content and carbon sequestration. If you’ve been a member for a little while, you’ll know Farmer Al has a passion for building soil health, so it is no surprise Rachel has found a home at Frog Hollow Farm. Rachel is developing an ongoing soil health monitoring protocol for our farm which will include annual soil sampling and analysis. This Fall, we will pull samples of soil from various blocks of the orchard to give us our baseline data. These samples will be analyzed for chemical, physical and biological content to give us insight into our microbial biomass levels and populations, micro and macronutrient levels, cation ratios and the structure of our soil. Every year, the same areas of the orchard will be analyzed so we can monitor how things are changing over time. With this knowledge, we can customize amendments based on the needs of a particular block in the orchard. We could develop compost richer in specific microbes for a particular area, or apply different amendments, such as oyster shell, to alter chemical composition. Having deeper knowledge of the soils throughout the orchard will allow us to enhance our soil health program and tailor our amendments based on the specific needs of the various blocks of the orchard.